OUR EARTH IN 2011 ~~ CAN WE FINALLY HEAR HER WAKE-UP CALLS? It is only greed of corporate minds that has created the situation we now face...and laziness in ourselves. We're all a part of the problem. We do well to begin taking more responsibility for our sustainability...and that begins with some sacrifice, and attention to our Earth Mother. SHE is our home...not the nice suburban or mountain chateau we inhabit with running water and buttons that switch on fans, heat and air conditioners. As well, our Food Chain is severely compromised so that chemical companies and other large corporations can control the money spent on food. Some of the ways I'm taking responsibility for Change in this is to continue buying Certified Organic food...I had relaxed my values for a time and would occasionally buy non-organic, but now that I realize that my Informed Choice has been usurped by the "rights to make money" of corporations...with laws slipped in to say that they are not liable to label GMO's...I have decided to ONLY buy ORGANICALLY CERTIFIED foods from only stores that have sustained their integrity. As well, I will patronize ONLY ORGANIC RESTAURANTS/CAFES. If you think this is a good idea, I hope you will join me as I TELL RESTAURANTS I ONCE PATRONIZED THAT I WILL NOT BE GOING THERE ANYMORE BECAUSE I KNOW THE FOOD THEY ARE COOKING IS LARGELY IF NOT ALL GENETICALLY MODIFIED ORGANISMS AND HEAVILY SPRAYED WITH PESTICIDES. If enough people pull back their money and put it to only beneficial sources, more awareness and more change will occur...more beneficial choices will be made by those who purchase food for resale...they will be forced to. Are you aware that #1 plastics are toxic? Even organic foods, and so-called pure water are being encased in #1 plastics? Why not return all your bottled water found in #1 bottles and tell the store, as I am about to do...that you don't want toxic plastic tainting your water and making you sick? Any other number, to my understanding, is safe. To read this [full] article online complete with pictures, just click here. On Thursday March 10, 2011, an earthquake measuring 9.0 on the Richter scale struck Japan at 9:46:23 pm Pacific Daylight Time [PDT]. This earthquake was followed by a devastating tsunami that cut off power to six nuclear power plants located in the northeastern part of Japan, resulting in a nuclear crisis caused by overheating which threatens to create multiple Chernobyls if the situation spirals out of control. Jane and I are humbled by the suffering of those in our sister country of Japan, especially in light of the tremendous gifts the Japanese have given to American culture, from Sony TVs to Lexus sedans, and from the animated movie Princess Mononoke by Hayao Miyazaki to the practice of Reiki. [Windhorse is dubious about all the gifts except Reiki.] Reiki is a Twentieth Century Japanese system of natural healing and spiritual enlightenment, introduced to the world by Dr. Mikao Usui. Usui called his system Usui Shiki Reiki Ryoho , which means The Usui System of Reiki Healing. Jane and I are Reiki practitioners, and we are Reiki Masters, and like all those who are Reiki practitioners or teachers, we send our warmest love, our deepest prayers for healing and an abundant flow of Reiki energy to the people of Japan with much gratitude. Throughout the days to come, through the Full Moon, and past the Equinox, for the next month let us meditate together, pray together, and send energy, Reiki, and blessings to the Japanese people and to the elementals, the devas, the nature spirits in Japan, especially in the radiation-afflicted areas. Let us each do these practices in our own time and in our own way and let us all know that by doing this we are indeed working together, co-creating a continuing thread of love and light weaving through time and space that will illuminate the history that brought us to this time of crisis, enlighten us in the present moment, and help create a brighter future for all those who are suffering in Japan, and for all the rest of us as well. Let us all send love offerings, healing prayers and mantras, and abundant material support to our suffering neighbors in Japan. Astrologer April Elliott Kent discusses the miserly response to the Japanese disaster in her Full Moon in Virgo newsletter on the website Mooncircles. Kent says, ". . .this morning I read that charitable giving in the wake of last week’s catastrophes in Japan is a fraction of the levels seen after comparable disasters. Almost a week after the 9.0 earthquake and tsunami, charitable donations stood at almost $25 million. This figure is startlingly low compared to $228 million raised in the same amount of time for Haiti after the January 2010 earthquake; $248 million after Hurricane Katrina in August 2005; and $227 million after the December 2004 Indian Ocean tsunami." For information on a vast array of four-star rated charities involved in relief efforts for the Japanese people, here's the Charity Navigator Guide to Relief Efforts for Victims of the Japanese Tsunami and Earthquake. These types of disasters create repercussions in the realms of subtle energy. In the astral realm a tsunami of negative emotions can arise in those who are suffering, and then people around the world who are awakening, and who are sensitive to subtle energies, are feeling the fear and suffering as if it were their own. Lightworkers are also vulnerable to excessive identification with the pain and suffering of this catastrophe's victims, amplifying the stress levels of the collective consciousness. It is important during times of crisis for Lightworkers to perceive the negative emotions being released by the victims rather than repressing their feelings, and then to allow these negative energies of the collective consciousness to pass through them, never holding on. Jane and I have written a very helpful guide to Psychic Self Defense which should provide helpful tips and techniques for energy workers beset by negative energies during this crisis. On a subtle level we are all family, and we share a group mind with our brothers and sisters in Japan, although we are unaware of how connected and inter-connected we are, how symbiotic our relationship, how much like a dysfunctional family split apart by inner conflicts, we really are. But when a disaster like this occurs, those who are sensitive feel the event in their bodies, it invades their dreams, it is perceived directly as the Earth trembles and island nations slip and slide on tectonic plates anchoring them to their true Mother. Then those of us in California remember that the Japanese are our neighbors, they are our family. We feel them even in their absence when life-changing passages occur, just as we feel the highs and lows of parents, children, and loved ones, even and especially pets, even at a distance. This awareness of the interdependence of all living beings is one truth that arises from contemplation of our own thoughts and emotions in the wake of the disaster in Japan. The same tsunami that devastated Japan came ashore here in Northern California the other day in an attenuated form, merely wrecking several million dollars worth of boats in Santa Cruz, south of San Francisco, and upwards of $25 million of damage in Crescent City, north of San Francisco. Now those of us who live in California are acutely aware that we also live on the Ring of Fire around the Pacific Ocean where so much geophysical stress is located, and where frequent earthquakes and volcanic eruptions occur. We are acutely aware that if the situation at the Japanese nuclear reactors goes "pear-shaped" as the engineers say, then we in the Golden State could soon be displaying an unwanted glow, wind across the waters. We are family with all those who live around the Ring of Fire. This awareness of the interdependence of all eco-systems on the planet is one truth that arises from contemplation of the geological structure of the Earth in the wake of the disaster in Japan. Jane and I believe that by seeing the spiritual meaning in our lives, even the most devastating events in our lives can become opportunities for growth and for accelerated spiritual development. So we recommend that you read an article entitled Japan's Earthquake and Tsunami 2011 by Philip Lindsay of the Esoteric Astrologer website, which puts these mind-numbing events into a spiritual context. 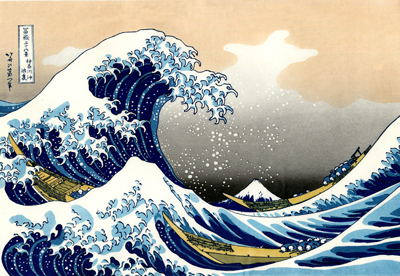 "Tsunami is a Japanese word meaning ‘harbour wave’, no doubt coined from this nation’s extensive experience with them. 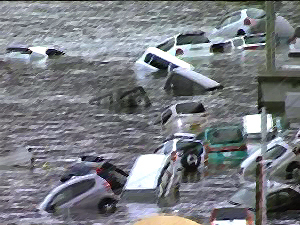 The latest earthquake and tsunami has caused Japan’s biggest crisis since World War II," explains Lindsay. "The devastation has taken many lives, created several nuclear plant crises and not only plunges the already ailing Japanese economy into further jeopardy, but impacts upon the whole world," continues Lindsay. "Obtaining an esoteric perspective of events allows us to move past the outer maya that enshrouds these kind of tragedies." "It is probably the first time that a tsunami has been filmed live and so thoroughly as it approached the Japanese coast, capturing the subsequent deluge and destruction upon the coast," Lindsay points out. "Most of it was probably filmed on Japanese video cameras! Yet apart from any voyeuristic info-tainment in some media, the coverage has been a good thing, connecting the rest of the world instantaneously to the plight of the Japanese people, allowing an outpouring of compassion and assistance. It has also raised issues in many nations about the dangers associated with nuclear technology. Hence events like this, whilst painful for many, bring the world closer together in a recognition of its common humanity, leading to a greater sharing of resources and international co-operation – materially and spiritually." We inhabit many cycles of time simultaneously, and some scientists say that earthquakes and other major geological events occur in cycles. 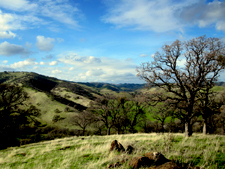 They say that clusters of similar events surround major geological events, and that by studying the occurrence of these clusters of events, one can look for them in the future and perhaps use their incidence as an early warning system, enabling the geological forecaster to predict future earthquakes. The same geologist who predicted the 1989 San Francisco Earthquake four days in advance says in a startling video on YouTube that this Full Moon is a period of extremely high risk for earthquake activity in Northern California. This Saturday [3/19/2011] at 11:10 am PDT (2:10 pm EDT) the Full Moon occurs at 28˚ 28' Virgo, and is known as a "SuperMoon" because the moon will be at its closest approach to Earth during its elliptical orbit at this time. 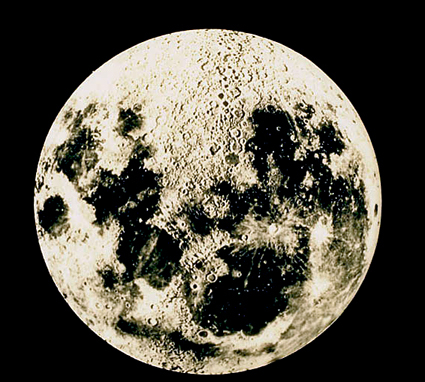 The Moon will appear huge when it rises at sunset, and "being so close to the vernal equinox, this SuperMoon occurs within hours of the moment the full moon crosses the celestial equator from north to south, just as the Sun crosses in the opposite direction," explains astrologer Noel Tyl, who coined the term SuperMoon many years ago. Tyl associates such a SuperMoon with geophysical stresses, including earthquakes and tsunamis. There was a SuperMoon in February as well, and the Japan earthquake and tsunami occurred between these two highly charged lunar events, but outside of the window of maximum import as divined by Tyl. The Sabian Symbol for 29˚ Virgo says, "A seeker after occult knowledge is reading an ancient scroll that illuminates his mind. After a crisis one should seek to realign the renewed consciousness with the primordial Revelation of the Truth of Man." This is excellent advice for all of us as we deal with the aftermath of this month's worldwide turmoil, which highlights the ongoing crisis of our globalized industrial civilization. The impact of last week's earthquake, tsunami and nuclear crisis in Japan has reverberated around the world, and has revealed some very disturbing truths about our host planet Gaia and also about human civilization in the early years of the 21st century. We humans are reminded that we are tiny, impermanent visitors to this blue-green planet, and that our Mother Earth has a life of her own, which dwarfs humanity's existence. When Earth changes affect our Mother, all humanity is affected. Reuters news agency reports that this earthquake and tsunami altered the Earth itself in profound ways. Last week's devastating earthquake and tsunami in Japan actually moved the island closer to the United States and shifted the planet's axis. "The quake caused a rift 15 miles below the sea floor that stretched 186 miles long and 93 miles wide," reports Liz Goodwin, in a March 14 Reuters dispatch. "The areas closest to the epicenter of the quake jumped a full 13 feet closer to the United States, geophysicist Ross Stein at the United States Geological Survey told The New York Times." "The 9.0 magnitude quake (the fourth-largest recorded since 1900) was caused when the Pacific tectonic plate dove under the North American plate, which shifted Eastern Japan towards North America by about 13 feet (see NASA's before and after photos at right),"
and sank Japan downward by about two feet. As Japan's eastern coastline sunk, the tsunami's waves rolled in." We all know the rest of the story by now. 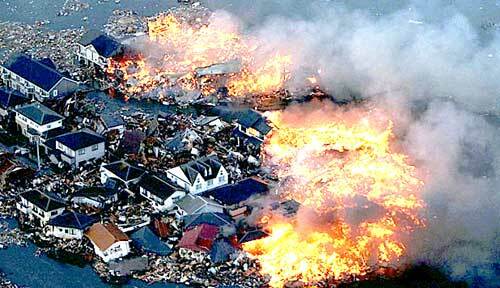 The earthquake and tsunami resulted in a catastrophe of global proportions. which houses six nuclear reactors. The UK Telegraph warns of a potential “nuclear nightmare” and considers the Fukushima crisis the second worst nuclear disaster in history. “The Fukushima crisis now rates as a more serious accident than the partial meltdown at Three Mile Island in the US in 1979, and is second only to the 1986 Chernobyl disaster, according to the French nuclear safety authority. There is also the possibility that the spent fuel rods, which are kept in containment pools of water near the reactors, may overheat and then release tremendous amounts of radioactive material into the air. It appears that the water in at least one of these pools has vaporized to a great extent, as of this writing, and that the situation is critical. What could happen if the spent fuel rods ignite? "An October 2000 report from the Sandia Labs in Albuquerque painted a grim picture of the consequences from a pool fire," reports Jeffrey St. Clair, in an article on the Counterpunch website. "The report [on the Shearon Harris plant in North Carolina], which was kept under wraps for two years by the NRC, found that a waste pool fire could spread radioactive debris over a 500-mile radius, including Cesium-137, a carcinogen linked to birth defects and genetic damage." 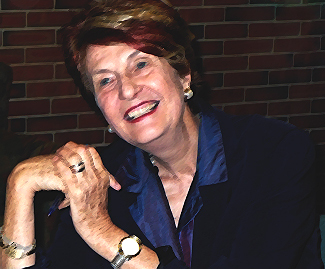 Dr. Helen Caldicott, a famous international analyst of all things nuclear and a tireless veteran of the anti-nuclear movement, called the situation in Japan an “absolute disaster”, according to an article on the Global Research website by David Donovan. “The situation is very grim and not just for the Japanese people,” said Dr Caldicott. “If both reactors blow then the whole of the Northern Hemisphere may be affected,” she said. ". . .In the northern hemisphere, many millions could get cancer”. Dr Caldicott cited a report from the New York Academy of Sciences, which said that over 1 million people have died as a direct result of the 1986 melt-down at Chernobyl, mostly from cancer. She said authorities had attempted to “hush up” the full scale of the Chernobyl disaster. The official 2005 figure from the International Atomic Energy Agency was just 4,000 fatalities. In the Chernobyl disaster, nuclear fallout appeared as far away as England, and Swedish farmers discovered radioactive trace elements in crops and farm animals. The bulk of the fallout was carried about 1,000 miles from the site of the meltdown. Because the Japanese government has not released any hard figures on the amount of radiation leaking from the Fukushima reactor complex or the amount measured in nearby areas, it is very difficult for independent analysts to offer meaningful forecasts or probable scenarios with any degree of accuracy. This type of situation calls upon our powers of discernment. This week a horde of websites referenced a map of the jet stream purporting to be from the Australian Radiation Services which shows that the fallout from Fukushima would travel from Japan to California -- probably in just a few days, perhaps arriving as early as this Friday, March 18. The debunking website Snopes.com offered an article warning about the authenticity of this map, which did not come from the Australian Radiation Services at all, but rather is a Photoshopper's concoction designed to spread misinformation among an uncritical public. The Australian Radiation Services website says: "Australian Radiation Services is aware of information about radioactive contamination being spread from the Japanese nuclear reactor incident released under the ARS logo and name. We wish to be clear that this information has not originated from ARS and as such distance ourselves from any such misinformation." The jet stream does travel across the Pacific from Japan to the West Coast. However the jet stream is approximately five miles above the surface. Nuclear weapons release tremendous volumes of radioactive material in giant mushroom clouds, and these types of explosions do carry radioactive material into the jet stream, but the slow-motion Fukushima meltdowns are not at present impacting the jet stream in a major way, according to the best sources I have seen so far. As I understand it, based upon my [Curtis Lang] limited research thus far, it appears that in the event that fuel rods ignite or in the worst case scenario envisioned by Dr. Michiko Kaku, there would be so much radioactive material released that some of it would find its way into the jet stream and the end result would be what Dr. Caldicott warns about -- the potential contamination, to some unknown extent, of the entire Northern Hemisphere. Here in Northern California, where the tsunami destroyed a few million dollars worth of boats and a few structures near the water in Santa Cruz and Crescent City, everyone is hyper-aware of the fact that we live on the "Ring of Fire" which extends around the Pacific Rim, and is home to most volcanoes and earthquake activity in the world. Potassium iodide tablets have been sold out in our area, and there is a global run on hand-held, affordable radiation detectors on the Internet. Just try to buy one and you'll be told there's a three month wait for many models. Reports on the Internet show that there are similar runs on anti-radiation pills and devices in Russia and China, Japan's near neighbors. There is a panic setting in across the globe. It is interesting to note that in the wake of this unprecedented catastrophe, donations to provide relief to the Japanese people are running at about 1/10 of the level that was recorded after the Haitian earthquake or after Hurricane Katrina. It appears that in this case fear is the predominant emotional reaction rather than loving compassion. Personally, I find this all quite interesting. We human beings, in our species-centric pride, tend to measure all things in our Universe by our own height and weight, so to speak. The Japanese crisis reminds us that the Earth, our Mother, is subject to transformations on a scale that the human mind can barely comprehend, and that we human beings are not Lords of Earthly Creation, but just tiny sparks of Divinity residing in extremely impermanent physical bodies, subject to forces that dwarf our own powers, hopes, plans and dreams. Our amazing global industrial civilization has empowered humanity to perform many technological feats that would have appeared to be sheer magic to our ancestors, but even so, our current way of life is very clearly changing in ways so profound we cannot imagine the outcome. The Age of Oil, as we have often remarked on this website, is coming to an end after over one hundred years of wars for control of scarce hydrocarbon resources. Those wars resulted in the creation of the first truly global Empire of Oil. The American Empire. "The U.S. Military (Department of Defense) is the largest single institutional consumer of energy in the world, and more than 80% of its energy budget was spent on oil in 2008," says Ashvin Pandurangi, in his article When the Lights Go Out on the Automatic Earth website. "It relies on oil for almost all of its critical functions, from transporting its troops to providing them with food, toothpaste and toilet paper, as well as the manufacture of weapons and armor, among other things. This institution, combined with a network of major financial institutions and a few dozen primary defense contractors (Boeing, Lockheed Martin, Blackwater (aka Xe), etc. ), represent the core of global elite power structures and their most valuable mechanism of oppression." The American Empire has brought us a globalized neo-feudal social architecture which has brought us such wonders as the Internet, jet-set vacations for the middle classes, suburban car culture, the hypnotic drone of mass media and mass advertising, globalized supply chains and sweatshop couture, and industrialized agriculture. All these wonders have their downside, including global climate change, dwindling energy resources, endless war and the increasing militarization of societies around the globe. Over the last few years it has become increasingly clear that current oil and gas resources are inadequate to fuel both the American Empire in its current form and the aspiring new global economic super-states of China, India, and Brazil. Competition for these scarce resources has resulted in the cultural and political destabilization of the entire Middle East. This month we saw political turmoil spread from Tunisia and Egypt into Libya, a key player in the global oil markets. For the first time in memory, Saudi Arabia's oil-rich Sheikhs had to crush dissenters with military force, on their own soil and in the neighboring kingdom of Bahrain. These new developments have once again pitted Sunni Moslems, who are the ruling classes in these countries, against Shiite Moslems, who are more numerous but less affluent segments of Middle Eastern societies. The same social split in Iraq resulted in a nasty civil war that has yet to come to an end, despite years of American "peace-keeping operations". The BP oil disaster in the Gulf of Mexico further highlighted the fact that increasingly desperate attempts to tap new sources of oil and gas in deep undersea locations create unacceptable environmental risks, and yet governments and oil companies around the world continue to pursue risky development strategies in locations as precarious as the platforms in the Gulf offshore from Texas and Louisiana. Many members of the globalized elite, including America's President Obama, advocate the building of a new generation of nuclear power plants to replace dwindling supplies of oil and gas and sustain business as usual in the Age of Oil. There is no indication from President Obama or the Democrats in Congress that they understand that the nuclear energy option is no longer viable for America. "A few months ago, President Obama signed some 8.5 billion dollar loan guarantees for a nuclear reactor construction project for U.S. nuclear corporation Southern Company, in partnership with the Tokyo Electric Power Company (TEPCO)," reports Keith Harmon Snow, in an article titled Nuclear Apocalypse in Japan: Lifting the Veil of Nuclear Catastrophe and Cover-up on the Global Research website. "Of course, the Price Andersen Act, passed in 1957, indemnifies nuclear utilities and reactor operators from all lawsuits, financial liability or related responsibility," Snow explains. "Everything suggests that it will be business as usual. Destabilization, destruction, war and catastrophe have always been turned into a big business for the United States of America," Snow continues. "Across the ocean tens of thousands of people are protesting in Germany and France and Briton. Here, even the discussion is off course. The wrong questions are being asked and the wrong people are answering them. Instead of talking about limits to growth, the focus is on expansion, profits, trade and so-called progress." "Perhaps the worst horror of all is that people trapped in the contaminated zones are now being shunned by outsiders, including aid organizations," Snow concludes. "Radiation fears, mingled with a sick sense of abandonment, reported the Los Angeles Times, as people are afraid to help them. People in the evacuation zones - elders and those without fuel or transport -- are getting no help, and no information. We should be humbled." This week's disaster in Japan revealed the tremendous fear that accidents involving nuclear power trigger in the human psyche. For the last thirty years, since the anti-war and anti-nuclear weapons movements of the Eighties dissipated, mainstream culture has pretended that nuclear war was impossible, because the Cold War between the USSR and America had come to an end. This rather complacent mindset ignores the reality that Pakistan and India have enough nuclear weapons to irradiate one another fully many times over, and the capability to destroy one another's capital cities within mere minutes in a first strike that would be undetectable to the other side until far too late to retaliate or evacuate before disaster struck. As this week's events have demonstrated, a massive release of radioactive material, as in a war or major nuclear power accident, could easily contaminate half the Earth, resulting in millions of casualties over decades of time. During the 9/11 strike against Manhattan, Jane and I lived in the suburbs of New York, and on that day one of the airplanes that flew into the Twin Towers sped over the Indian Point nuclear power plant, only a half hour from Manhattan, and a few miles from our home. Although we were made acutely aware of the risks by these catastrophic events, political leaders of the American Empire remain blissfully confident of their ability to contain these risks while pursuing never ending war in countries around the world and simultaneously building a new generation of nuclear reactors. This week we discovered that there are approximately thirty-four nuclear reactors in America similar in construction to the obsolete Fukushima nuclear complex, which is composed of aging boiling water reactors manufactured by General Electric, which were declared unsafe by scientists decades ago. In a March 14 article in the UK Guardian, Suzanne Goldenberg reports as follows: "Government regulators knew of a heightened risk of explosion in the type of nuclear reactors used at the Fukushima plant in Japan from the moment they went into operation." "Safety inspectors at America's Atomic Energy Commission (AEC) warned as early as 1972 that the General Electric reactors, which did away with the traditional large containment domes, were more vulnerable to explosion and more vulnerable to the release of radiation if a meltdown occurred." "Michael Mariotte, director of the Nuclear Information and Resource Service, said: 'The concern has been there all along that this containment building was not strong enough and the pressure containment system was not robust enough to prevent an explosion.'" At this point in the weekly news cycle it is clear that this crisis is far from over. The danger of a critical meltdown or of ignition of spent fuel rods remains acute. There is a clear feeling among most people I have talked to that there will be a cover-up of the truth similar to the cover-up that occurred during and after the BP oil spill. When the people can no longer trust the government or the news media in times of crisis, fear is the understandable reaction. As of this time, I can only say that it is important to monitor the situation. If there is a catastrophic meltdown or if spent fuel rods ignite, the whole world will be watching. If such an event does occur, it is important to know that, despite any assurances to the contrary, the entire West Coast of America, and the entire Northern Hemisphere, are in danger. So now recent events in the Gulf of Mexico and Japan have shown that neither increased offshore drilling nor expansion of nuclear power facilities around the world present a desirable path forward in the era of Peak Oil -- an era of Peak Oil Demand. It is becoming increasingly clear that those who profit the most from the current neo-liberal capitalist paradigm of globalized oil-driven industrialization will have to sacrifice any high-minded concerns about the environment if they are to continue to grow the global economy. In fact, they will have to throw environmentalists over the side of the boat without any lifejackets if they are to simply to find environmentally dirty ways to maintain the status quo. It is no coincidence, then, that the Republican party has made the gutting of environmental regulations and agencies a cornerstone of its party platform in the run-up to the 2012 elections. 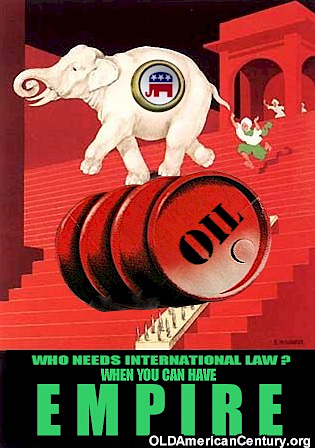 The Republican party prides itself on being the most robust champion of the interests of multi-national corporations, Wall Street, the military-industrial complex, and big oil companies especially. Japan may have to import millions more barrels of oil a year to replace the energy they've lost at Fukushima. What will that do to the price of oil as instability spreads in the Middle East? What will that oil price rise do the already staggering global economy, mired in both recession and inflation simultaneously? "The American imperial presence in the Middle East and elsewhere, which currently backstops a global economic system that provides the 5% of us who live in America with 25% of the world’s energy resources and around 33% of its raw materials and industrial product, has a relatively short shelf life ahead of it, and as that comes unraveled, we are all going to have to learn to live with much less," says Archdruid John Michael Greer in his recent article "The Limits of Incantation." The good news is that the typical American uses much more energy than someone with a similar status in Europe to sustain a lifestyle that is more hectic, more competitive, less fulfilling, and much, much more wasteful than the European. And then there's the omnivorous American war machine, which must be starved of oil to preserve global civilization. So there are clearly many opportunities available to apply energy efficiencies to the American way of life without destroying the entire global civilization. That's a good thing, because we need time and energy and money to restructure our civilization, begin to implement energy conservation on a huge scale, to create a new sustainable economy and a new sustainable social order based on peace, not war. All in all, it was a week that shocked us all, that caused an understandable wave of fear to sweep the global solar plexus, as we all became conscious and crystal clear about how frightening nuclear energy really is, and how our illusions of controlling this form of energy are perhaps equally dangerous. "A seeker after occult knowledge is reading an ancient scroll that illuminates his mind. After a crisis one should seek to realign the renewed consciousness with the primordial Revelation of the Truth of Man." That Truth is one behind the many Masks of God revealed in our many religions and spiritual traditions. The Truth is that life involves suffering as well as joy. The Truth is that when we become truly aware of the suffering of others, we respond by opening our hearts. The Truth is that when our hearts open in compassion for others, and we feel their pain as our own, we respond to their need as we would respond to our own. We give freely. This weekend let us give freely of ourselves. Let us give love offerings to the Japanese people to honor them in this hour of their need. "When the energy of love is strong in us, we can send it to beings in all directions. But we must not think that love meditation is only an act of imagination--we imagine our love as being like waves of sound or light, or like a pure, white cloud that forms slowly and gradually spreads out to envelope the whole world. A true cloud produces rain. Sound and light penetrate everywhere, and our love must do the same. We have to observe whether our mind of love is present in our actual contact with others. Practicing love meditation in the sitting position is only the beginning." From the book,"Teachings On Love," published by Parallax Press. Copyright ©2003-2011 by SatyaCenter. All rights reserved. Permission is required for reproduction of any part of this work. May all sentient beings achieve consciousness...NOW. 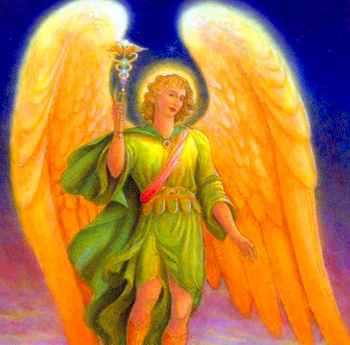 Beloved Archangel Raphael, Angel of Healing and Medicine, help us! 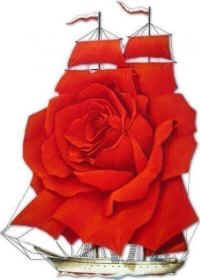 Build your vessel to last the whole voyage, and keep afloat.